Conventional diagnostic imaging reveals changes in morphology or organ functions that occur at a later stage than impacts visible at the molecular level. It is thus of high relevance to focus on early responses in molecular imaging to understand the biochemical pathways of diseases and effects of substances. Notably, magnetic resonance imaging (MRI) and the nuclear magnetic resonance (NMR) are potent modalities in biomedical imaging. However, conventional NMR/MRI which detects the water proton signal in biological samples suffers from intrinsically low sensitivity. The present new technology combines highly sensitive hyperpolarized xenon biosensors for NMR/MRI to non-invasively sense the critical second messenger calcium with high sensitivity. This technology provides a calcium sensor for NMR and MRI, based on spectral changes of the NMR signature of temporarily encapsulated hyperpolarized 129Xenon caused by calcium-dependent changes of the local environment of a Xenon-binding molecule coupled to calcium-binding proteins or peptides. 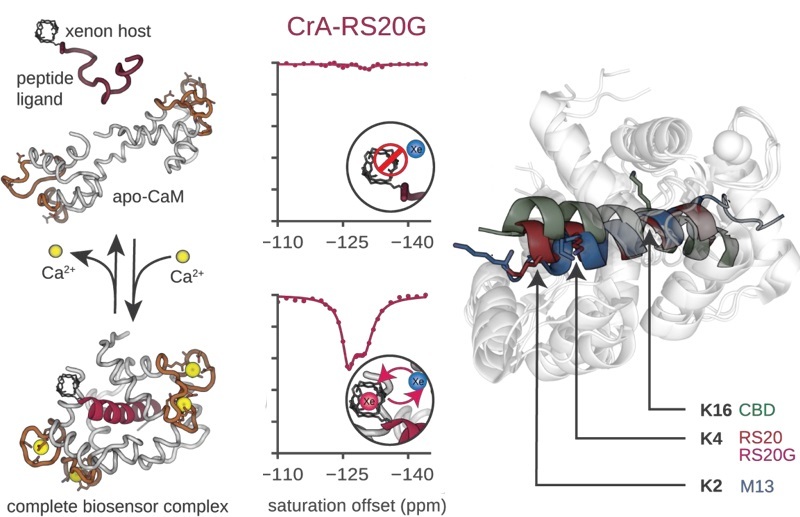 A xenon-binding cage-like molecule such as cryptophane is conjugated to a peptide such as RS20 that binds to an EF hand protein such as calmodulin in a calcium-dependent manner. When hyperpolarized 129Xenon interacts with the cryptophane cage, its NMR signal exhibits a different chemical shift and/or switches Hyper-CEST efficiency when the peptide is bound to calmodulin as opposed to the unbound state; calcium binding and in vivo signaling can thus be read out via the chemical shift and/or changes in the Hyper-CEST effect. Since the 129Xenon is not bound covalently to the cage, the sensor can be delivered in advance, independently of the hyperpolarization lifetime, giving a significant advantage compared to compounds containing 13C or 15N that have short decay rates.